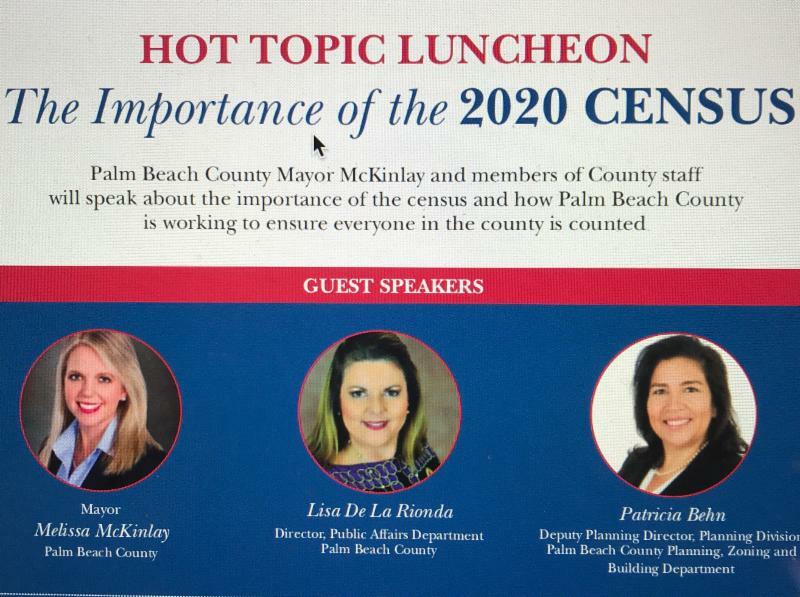 Registration begins at 11:00 a.m., Lunch is served promptly at 11:30 a.m.
Palm Beach County Mayor McKinlay and members of the County Administration staff will be talking about the importance of the Census and how Palm Beach County is working to preserve the census at our Saving the Census Hot Topic lunch on Wednesday, July 18, 2018, 11:30 a.m. – 1 p.m. at the Atlantis Country Club. Doors open at 11:00 am. Facebook Streaming begins at 12:10 p.m. You can register by pushing the button below. The cost, including lunch, is $25, $35 within 5 days of the event. Join LWVPBC for our August Hot Topic on Wednesday, August 15, 2018 from 11:30 a.m. to 1:00 p.m., with registration beginning at 11:00 a.m. Facebook streaming begins at 12:10 p.m. As always, it will be at Atlantis Country Club in Atlantis, Florida. The cost, including lunch, is $25, $35 within 5 days of the event. 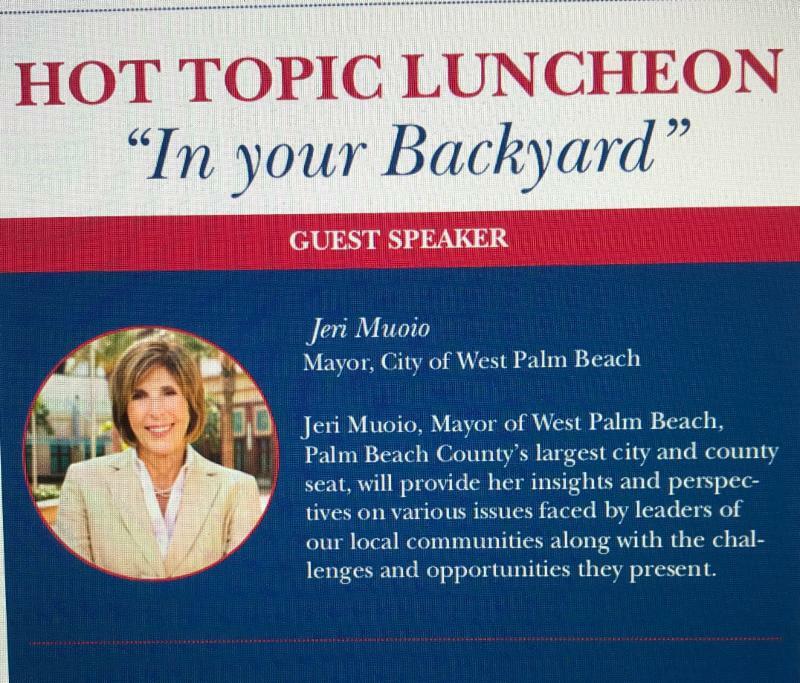 Mayor Jeri Muoio will discuss issues facing municipalities in Palm Beach County. As the mayor of West Palm Beach, the largest city in the county, she will address topics including affordable housing, homelessness, climate change, and the environment. 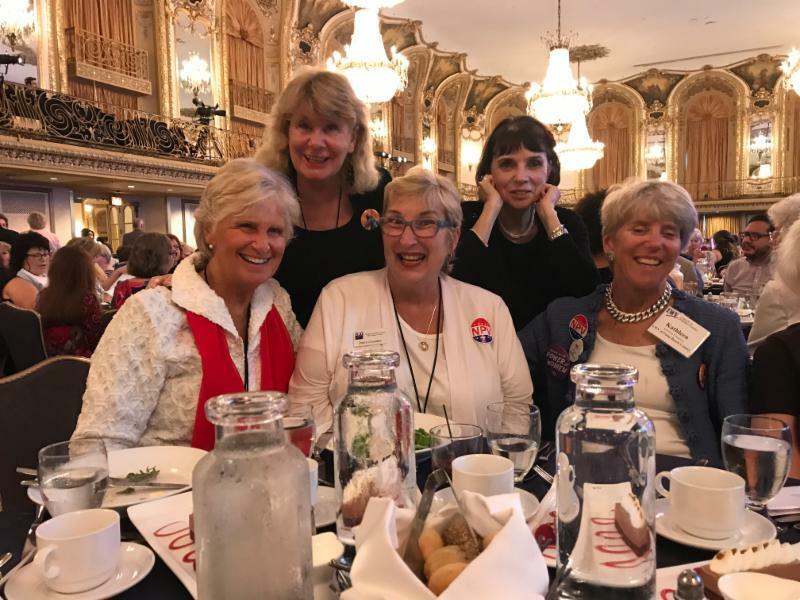 Florida was well represented at our national convention in Chicago! 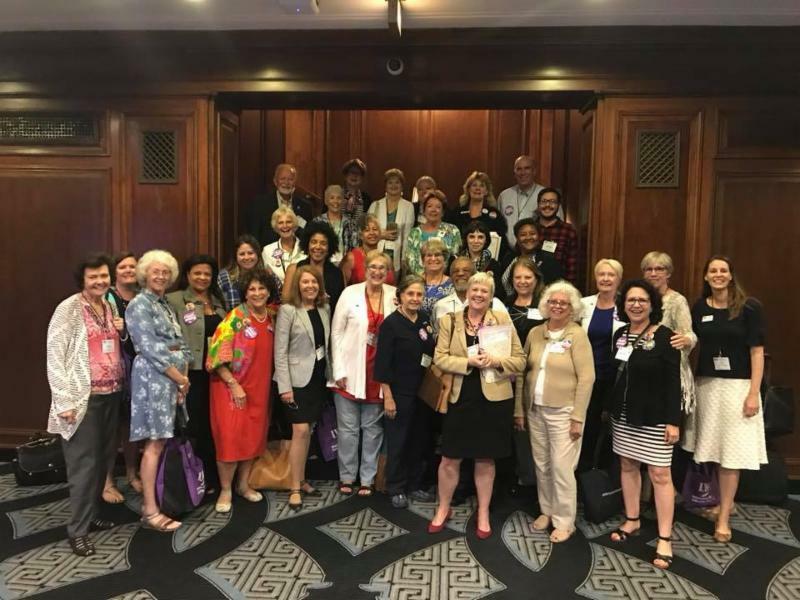 Delegates from Palm Beach County's local league were: Christene Campbell-Gabor, Debra Chandler, Kathleen Crampton, Nikki Descoteaux, Pamela Edwards-Roine (from Jacksonville), Jo Fellman, Deb Mazzaferro, Linda Prior, and Karen Wilkerson. Over 1,000 delegates from across the county attended. An impressive array of speakers presented information on diversity, voting rights, etc. In addition there were breakout sessions on a wide range of issues and organization management. Our delegates covered the gamut and reported on how fortunate we are in PBC to be ahead of the curve. That is due to the support of our members who are dedicated to studying and serving the public with information. Our biggest celebration was led by Kathleen Crampton which resulted in the National Popular Vote (for US President) being adopted as a priority by the convention. Yipee! If you have not already read our national President’s review of this event, please click on the button to the right. Future issues of NEWS will report on structural changes being consider by the national League. The League of Women Voters and many other Florida organizations have been working for almost 5 years to restore the vote for 1.5 million Floridians who have returned to society after serving their sentences for felony convictions (excluding murder or sexual offenses). After a long petition drive we will finally see Amendment 4 on the November 6 ballot. To succeed, Amendment 4 must receive 60% of the votes cast for Amendment 4. This requires a huge voter education effort. 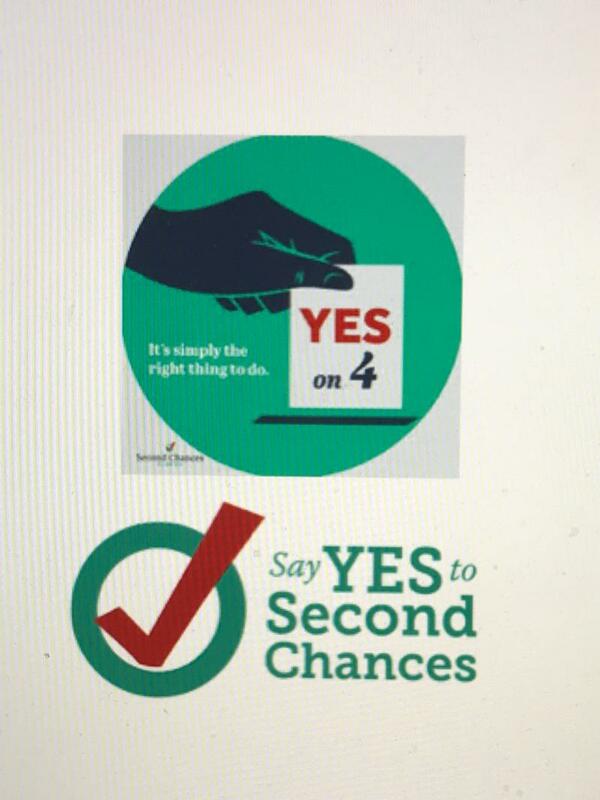 The Second Chances Campaign has launched initiatives that we all can be a part of. · Attend the Convening. On August 10 and 11 in Orlando the Second Convening will be held. At this convening the participants will learn about the events, schedule etc to take us to the successful finish line on November 6. Registration and more information is at www.floridarrc.com. · Adopt A Day. This program which will shortly launch is for organizations such as churches, synagogues, mosques, civic groups, HOAs to have members to come together for a few hours on the same day for phone banking and texting. Details are expected soon. A SPECIAL TRAINING session is scheduled for AUGUST 25, 2018, for members of the LWVPBC Speakers Bureau. 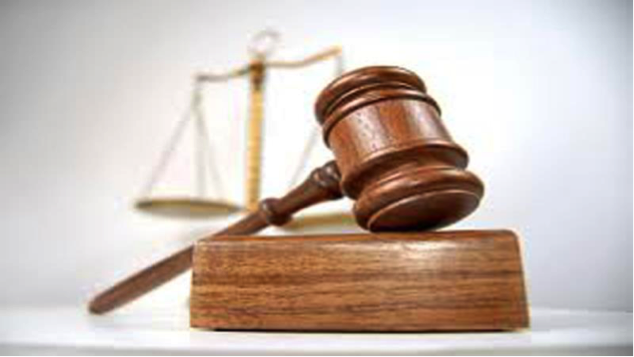 The meeting will start promptly at 10:00 a.m. and adjourn at 2:00 p.m. It will be held at the STEM building of the Science Museum. Contact Ethelene Jones for details. Training will be done by MARY JANE RANGE AND CORINNE MILLER. It will focus on the November ballot issues and will conclude with a refresher on using projectors. Participants should bring their own laptops. Participants will also meet incoming bureau chair, ANDREA WEISS. Andrea brings us a life time of executive and management experience. She has a background in nonprofit organizations and is devoted to nonpartisan actions that move the issue agenda. We are grateful for her involvement with our local League. We want to take this opportunity to thank Ethelene Jones for the work she has done to significantly expand the power point selections and organize this growing committee. Ethelene will continue to serve as the Florida State Speakers Bureau chair. Andrea Weiss is pictured above. When attending a League meeting, hospitality is a great way to meet and welcome people. 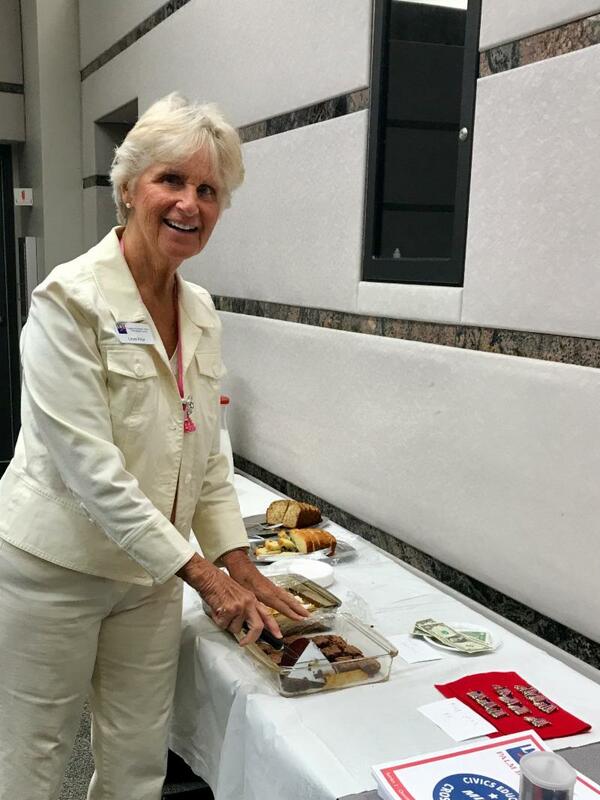 Would you like to help prepare “lite bites” at Cool Topics and New Member Orientation? We arrive a few minutes early to set up. If the meeting is in the morning, we have coffee, fruit, and something sweet. At an evening meeting, we have ice tea, fruit, cheese and crackers, and something tempting. I would love to have your help. Contact me: Linda Prior, Linda_Prior@hotmail.com , 561-702-0245. 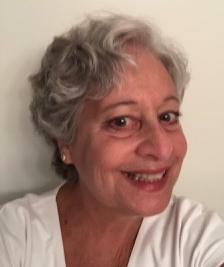 Jo F. Felman, Delray Beach; Rebecca Freeman, Boynton Beach; Diane Friedman, Boynton Beach; Stacey Halio, Delray Beach; Louise Lahr, Palm Beach Gardens; Barbara Lasdon, Boca Raton; Rhonda Lerner, West Palm Beach; Christina Pugliese, West Palm Beach; Greta Schultz, Boca Raton; Mary V. Toy, Lake Worth; Catherine D. Turk (SBA), Lake Worth; Shayla Zamora, West Palm Beach. For more information, call 561-276-4898. Pictured above is Young Leaguers Meeting, June 2018 at Bru's Room. Many migrants arriving at our borders from Guatemala, El Salvador and Honduras are fleeing violent persecution at the hands of their own governments and private actors. These families have endured the trauma of uprooting themselves and making the dangerous trek from their home countries to apply for asylum in the United States. 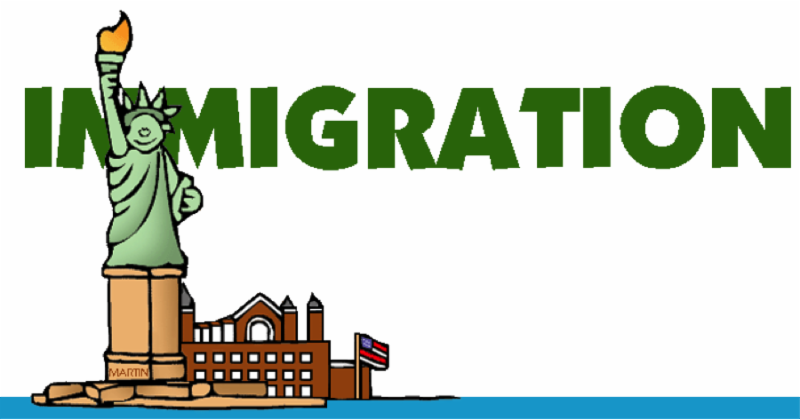 The United States is a signatory of the 1951 Refugee Convention and has the legal obligation to handle the asylum claims of those reaching our soil. Instead, every single asylum seeker has been forcibly detained and their children taken away to separate shelters across the country with no means of communication. To learn more about this crisis, what the league is doing in response, and what YOU can do, click the button below. You will also find the link to the letter to Congress. Former Secretary of State Madeline Albright draws on her personal history, extensive scholarship and diplomatic experience to survey recent autocrats, dictators, Fascists and Nazis. Each is described in the context of the cultural, economic and technological conditions that allowed for an extremely improbable candidate to be embraced. In times of tranquility, she says, we are willing to take time for thoughtful consideration of options and exploration of differences; but when action appears urgent, many want to be told what to do. 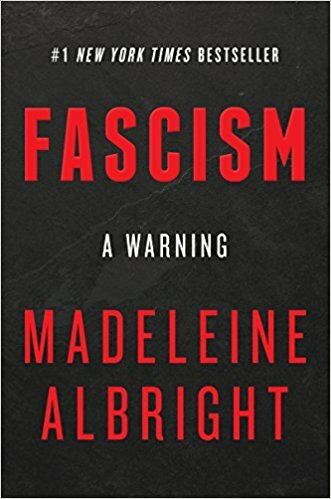 This inclination, Albright warns, is where Fascism gets its start. Her exploration of the character and personal characteristics of those who rise to power in such time is incisive; the appeal to their followers and the willingness to follow is uncanny. This book is important, readable, alarming. Albright believes that “for freedom to survive, it must be defended, and if lies are to stop, they must be exposed.” She concludes with a set of questions to ask ourselves about the leaders we propose, support or become. If you aren’t a reader, just reflect on those questions as you choose whom to follow or be. September 25 th will be a banner day in Palm Beach County! That day, which is National Voter Registration Day , the League, in collaboration with the School District, will carry out simultaneous voter registration in 23 high schools throughout the county. It is a massive undertaking and we need lots of experienced registrars to help. 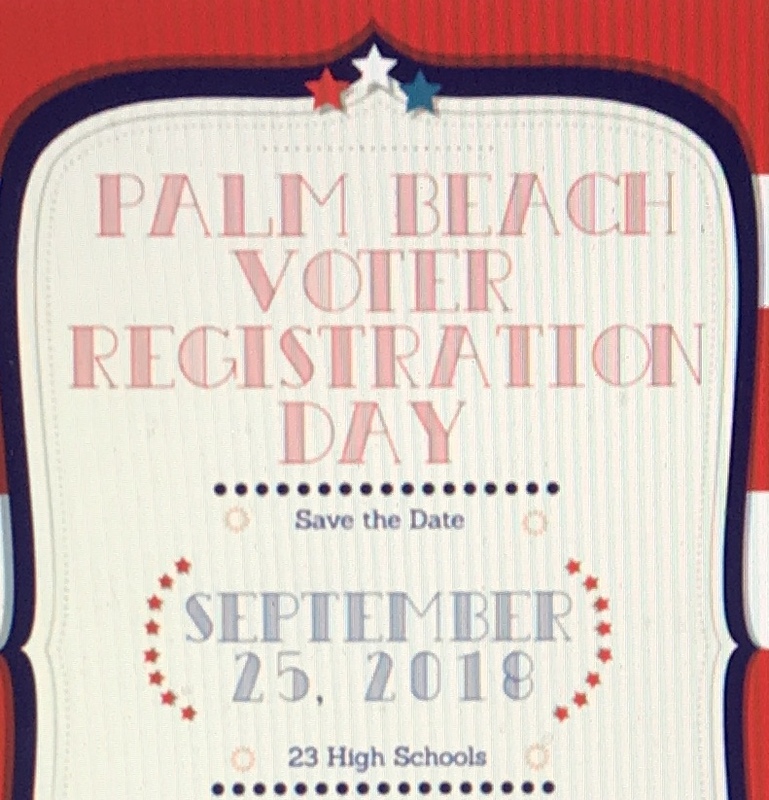 If you need to be trained or if it has been a while since you did voter registration and you need a refresher, please contact Pam Maldonado at (305) 873-4239 or maldonadopbc@gm ail.com . Trainings will be scheduled later in the summer. Everyone who would like to participate in this event needs to register on-line at the website set up by the School District (button below). Volunteers need to attend a 1 hour training on Sept. 8th from 9:30-10:30 a.m. or Sept. 13th from 3:30-4:30 p.m. at FHESC, 3300 Forest Hill Blvd., West Palm Beach, 33406, Thurber C & D. Contact Lori Dool at (561)714-5813 if you have questions. You will be contacted later about which school you’ll be assigned to. to schedule an event or a meeting, always check the calendar first to be certain that there are no major conflicts. Go to our website, lwvpbc.org, click on "Events", then click on Calendar. You can look at Calendar in grid or linear form. Once you select the Date, Time, and Location, get approval from your Chair, etc. send an email to Nancy Gau at jessiestar2@yahoo.com. INCLUDE TITLE, DATE, TIME AND PLACE. It is highly recommended that the Issue Groups with regularly scheduled meetings stick to a date, time, and location that works best for the majority of members. Several Chairs have used this system for years as it makes it easier for attendees to plan. It is also easier to manage the calendar when one entry can be made for recurring meetings, rather than having constant changes. If cancellations or changes are necessary, email Nancy Gau ASAP. Include BOTH old and new info, so that not only will the new date added, but the old one will be removed. PLEASE PROOF READ YOUR EMAILS BEFORE SENDING THEM. It is very easy with autocorrect for info to be incorrect and amusing. That can result in more confusion and inaccurate scheduling, though. Once you schedule an event or a meeting, please check the calendar periodically to be sure that it is there and is accurate. Occasionally little gremlins sneak in there and do nasty things. If you see an error or something missing, contact Nancy Gau ASAP and it will be fixed. You must log in to CX in order to see the Member Directory.